and help raise funds to build a state-of-the-art Pediatric Ambulatory Infusion Center for the children of Lake Havasu. The Norona Effect will also donate 5% of all the revenue generated towards the educational department for Lake Havasu City children. 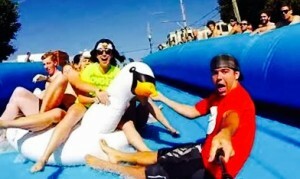 Become a HavaSlider and slide the world’s largest super-slide 1000 feet down. McCulloch Boulevard and the tallest dual-lane inflatable slide with a 42 foot drop! This is going to fun for the entire family! Registration booths will be located on Querio and McCulloch Blvd. There will be plenty of FREE PARKING along Mesquite and Swanson Avenues. All attendees must wear their wristband at all times when during the event. Wristbands will give you access to the HavaSlide all day event and unlimited entrance to the 1000 foot slide and the world’s tallest dual inflatable slide. All children under the age of 5 must be accompanied by a parent or guardian on the 1000 foot slide; children under 5 are not permitted to ride the 42 foot drop slide. Children 2 and under are not permitted on any slides. Tickets are available online. Bring your own or purchase an adult tube online for $2 each + $2 fee (standard-size adult tube). Tubes/rafts are mandatory! WHAT IS THE NORONA EFFECT? The Norona Effect was started by three sisters in an effort to help families and their children have immediate access to medical facilities to treat several life-threatening diseases. Nicole Norona, Brooke Queen and Tracy Henry, the daughters of Ron and Roberta Clifford (local residents of Lake Havasu City) all feel very passionate about this movement. Visit the Norona Effect website to learn more! The state-of-the-art Pediatric Ambulatory Infusion Center will offer treatments such as chemotherapy, hydration, stem cell infusion, IVIG, and blood transfusions. Many families have a difficult time commuting 3-4 hours for these treatments and will benefit from having these services provided locally.